Our personal protection dogs are loving members of your family. However, when faced with a threat, this K9 companion turns into a very effective criminal deterrent. 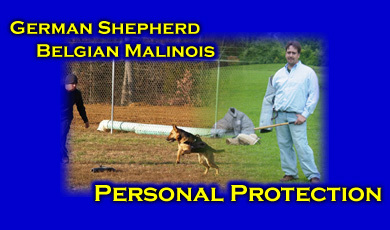 The safety and security a personal protection dog can provide is truly exceptional. The main focus of K-9CC is assisting pet owners with obedience training and/or behavior problems. I decline the majority of requests for personal protection dog training because the average person does not need it or is not willing to make the proper lifestyle changes to accommodate a trained personal protection dog. It is a large responsibility. What I offer most qualified clients is training as a deterrent only or what is known as an 'alert' dog that will bark on command and/or suspicious behavior. The handler should also have training in self defense or the use of a self defense item. A dog should not be your only line of defense in a dangerous criminal confrontation. Please take the time to educate yourself and make an informed decision. A personal protection dog may not be appropriate for you, your family, or your lifestyle. I do not have any dogs available at this time or in the near future, but, may be able to offer a referral to other reputable trainers/importers who specialize in matching qualified handlers to the right working dog, whether it is for sport, law enforcement, or protection.